Home Off Beat	Alcohol Wine Glass Lampshade Candle Lamp! 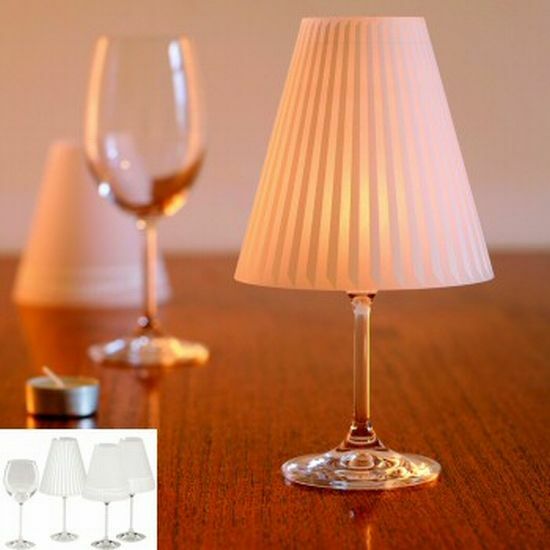 Alcohol Wine Glass Lampshade Candle Lamp! One of my New Year resolutions is to quit drinking! But until I dispose off those wine glasses (my dusk companions), somehow the urge seems to revive automatically. First I thought, lemme just chuck them in the bin, but why so? Just because I cannot control myself, doesnât give me a right to do away with anything and everything. Caught in a fix, I came across an âAlcohol Wine Glass Lampshade Candle Lampâ, which could convert my dusk companion into a beautiful light source. By placing a candle in a glass, with those shades on, my problem was sorted. If you too are on the same page, just bring home this set of three (lamp shades) for â¬ 14.00 and enjoy the difference. Glowing Gloves: Night time’s the right time! ← Heavy discount on i-Lit pinky color changing speakers!